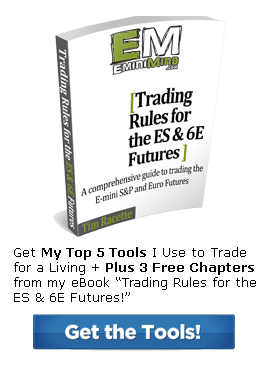 Trading with market internals such as the NYSE tick and market breadth can lead to increased efficiency in your entry’s and exits. While they are most commonly used for intraday trading, it is possible to trade larger timeframes. The NYSE tick is only available during regular trading hours of 9:30 AM EST – 4:00 PM EST as the data is derived from the New York Stock Exchange. The charts code below is for thinkorswim® charts (now powered by TDAmeritrade). Here I have optimized my NYSE tick chart setup for day trading the E-mini S&P Futures. Delete ‘plot Data = Close;’ and paste the following code below. Copy this tick range code into the new study box in thinkorswim®. Same as above, copy this code into a new study, save and activate. Funding Your Trading Account: How Much $ Do You Need? Free advice that really works is rare. Thank-you for this insight. 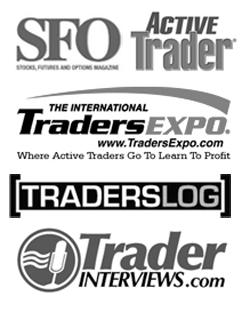 You clearly have some great ideas for making day trading a bit easier. I’m really enjoying all the free info on your site, much appreciated. I’m a struggling ES trader looking to get better. I’m using ToS and have implemented your tools on this page. Thanks Renato, happy to help and share my methods. Hi Tim, is ToS Think or Swim a charting software service run by Ameritrade simular to Esignal Supercharts etc. ?Ill get to your web site asap. Take care, eat well, sleep well, live well, and of course…..trade well. Yes it is John. TDAmeritrade acquired Thinkorswim in June of 2011. Esignal and Tradestation offer very comparable platforms, I’ve just been with TOS for the past 6 years and thus built some platform loyalty. Hi Nato, I’m not too sure on that specific invalid statement, however if you shoot a note over to support@thinkorswim.com they should know how to fix it. Yeah I am getting the same error, Nato did you get it figured out? I am NOT positive this is doing the same thing as the original code, so use at your own risk, but as of 11/18/2012 this removes the error on the TOS platform. I cannot get the Breadth Box code to work correctly in TOS. I am getting an error when I try to create the study. Hi Winnbridge, have you tried the modified code in Prescott’s post just above? There have been a few thinkorswim updates since I first published the code. support@thinkorswim.com has always been super helpful as well. I tried the modified code in Prescott’s post and still get an error from line 7 “addlabel” down through the end of the code. I just recopied the code over from my thinkorswim study editor. It appears Prescott was correct, the AddChartLabel was replaced by AddLabel. The script work. But they doesn’t refresh data. Any help please! Nick over at thinkorswim informed me that the last update caused an issue with the ‘AddLabel’ command. The latest update has since fixed the issue and the code above is working correctly on my system. You should be good to go! Tim, I use Infinity as the broker and Sierra Charts for charting. I have looked for something like this on their system with no luck, any ideas about how to build the above in Sierra? That I don’t Robert. Have you asked Jim or your individual broker at Infinity? I just Googled “Market Internals for Sierra Charts” and there were a couple of forum posts that might be helpful. I was having the same problem with the “breath box” not working in TOS, but I got it to work. Here is the script again. Thanks so much for this Tim. Sorry I should clarify how I made the change. At line 7, I deleted all info. from that line down, and then copied and pasted the code from the “ADVN/DECN that Tim has above. For some reason, even tho’ the codes are exactly the same from line 7 onward…the breath box code does not seem to want to compute in TOS, but A/D will. So now it should work. I’m copying and pasting what Trader69 has above and its not working. the AD LINE and TICKRANGE are the same exact link? Are they supposed to be? Actually the tick range and AD line are the same number, in each study. Are they supposed to be? Tim, thanks for sharing. I am enjoying your site the education and knowledge sharing by you. You’re welcome Steve! Happy to help. Hi Matt, I think this code will work as it has in there NBO for NYSE breadth open and QBO for NASDAQ breadth open. Tim, thanks again. Quick question. I copied it just as it is above. The first day it worked just as I expected. But that was the only day it has printed/registered a number in the NBO and QBO boxes…since then they just show zero. Any thoughts? Hmmm, you might try copying the code in an email to support@thinkorswim.com. With the latest software update they may be able to make a quick tweak to the code to get it to reset each day. Yep, that’s right Dru. 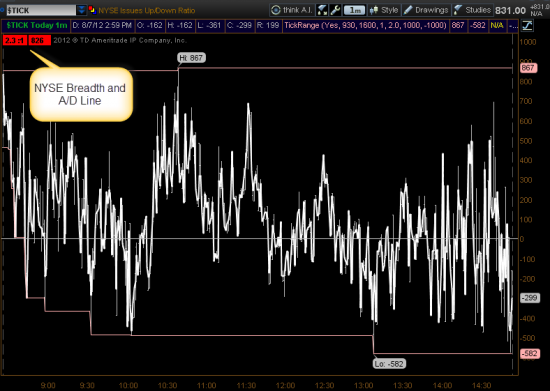 Market internals data is only available during RTH so after hours you see either a black box or the closing reading. for any one having problems getting code to work. I noticed that copy and paste left some strange characters, odd shape quotation marks and extra spaces that could contain strange ascii codes of unprintable characters. I did a little editing to fix this and it worked ok. This may be a problem with chrome ar maybe just my installation of chrome. I do not like to use charts that I do not understand so I spent some time looking at these scripts. They are generally pretty hacked up. I would be happy to fix them if you can tell me what you want. Here is an example of one that is “fixed,” except I don’t know what math you want or what display you want. this is an advance decline box that has a parameter that is configurable to let you choose between advance decline ratio or absolute advance decline. this probable cannot be copied and pasted because the comment lines wrapped. I added some pound signs to try and fix it but don’t know. How do you use these 2 labels, what are the trigger signs for your study? Hi Tim, I copied and pasted the codes that you posted on Aug 22, 2014 in my ToS. On my minute chart, all breadth box indicators are updated real time, except that NBO and QBO keep showing zeroes. Any clue why it happens? Good question Ed, I know with a few of the recent TOS updates some of the code has been adjusted. Your best bet is to shoot a note to support@thinkorswim.com and paste the code into the email and see if they can point out what needs to be adjusted. Not sure why it works in some platforms and not others. I experience the same thing and with a little bit of experimenting I think I may have figured out how to make it work. Please see the changes below and let me know if it works for you. I’m still trying to figure out how to make it work on the day chart. SecondsTillTime always = 0 so the above statement will always default to PosR and PosRQ and never the TheDaysOpenx. Ah that makes sense Ed, for my NYSE Tick code I do have it set to a 1-min period. I do still look at it Ian, mines always worked fine, to Eds comment, it seems you need to set the chart up exactly as I have using a 1-min time frame. I am used to charts with 2-min intervals. After I changed the time to 930, everything works like a charm. Thanks for the great work. I was wondering if you still use the $tick. I couldn’t get the NYSE tick code range working. There are some yellow arrow on the chart, i don’t know why. Just a note to anyone who might be having trouble getting the scripts to work, I found that simply copy/pasting the code into a ToS study did not work because the quotation marks in the website text are different characters than typing a normal quote on the keyboard and ToS did not like them. Once I typed in the quotation marks by hand, it worked. Hopefully this helps someone. First of all, thank you for all this. I have a question about the tick range study. i assume the yellow arrows are just to show when a bar crosses the 1000 level.Is that correct? Also, when i entered the code into thinkscript, it looks like it added bollinger bands too. in your video, i didnt see any. can you explain a little more how you use the bollinger bands? Hey Eric, that’s right the lighter colored line at the top and bottom just highlight the high tick for the day, they’re not really Bollinger bands, just a way to identify the highs and lows. You could get rid of them and just put a horizontal line at +/- 1000 if you want, that works too.